US-style yellow school buses should be introduced across England to improve pupil safety and ease traffic congestion, an education charity says. The Sutton Trust says a service costing taxpayers £124m a year would reduce the 40 deaths and 900 serious injuries caused annually by the school run. This would also allow poorer families more choice of where to send children and help tackle truancy, it adds. In the US 54% of pupils are said to use such buses, compared with 6% in the UK. The trust estimates that yellow buses - going from pick-up points near homes - would save primary school parents around £350m a year in time wasted and driving costs. Society would benefit by £100m, through better punctuality at work, more efficient communication and a cleaner environment. The trust says the school run puts two million extra cars on the roads at peak times each day. These churn out 2.1 million tonnes of carbon dioxide a year, adding to health problems such as asthma, it adds. Trust chairman Sir Peter Lampl said: "Nearly 20% of traffic on the UK's roads during the morning rush hour is on the school run, and this is increasing. "It leads directly to as many as 40 deaths and 900 serious injuries each year, and contributes more than two million tonnes of carbon dioxide annually to the atmosphere. "And the lack of adequate school transport has a social cost too, because it restricts the school choices of families, particularly those in disadvantaged circumstances." A report, carried out for the trust by the Boston Consulting Group, says the current system prevents poorer parents from exercising a "reasonable" amount of school choice. The law states that children under the age of eight are entitled to free transport only if they live more than two miles from the nearest "suitable school". For older pupils, the distance is three miles. Charging for yellow buses would have a "negative effect on usage", the trust's report claims. It recommends that all children eligible for free school meals should be eligible for free transport. In the US, yellow buses were "easily identifiable", while each child had an allocated seat. They delivered directly from a pick-up point near home, helping to reduce truancy, the report said. Staggered start times cut rush-hour road congestion. Yellow buses have been tested in some parts of the UK, including an £18.7m scheme in West Yorkshire. There, one bus cut 25,000 car journeys a year in the Hebden Bridge area. During the last parliament, ministers proposed a bill allowing local education authorities to charge for all school travel - strictly on people's ability to pay, "with an expectation that this would be no more than an average daily bus fare". But this legislation was not passed before the general election. I think it's a fantastic idea. As someone who has to share their work journey with a bus full of rowdy teenagers, the sooner we can get them segregated onto their own buses the better. Why all of this pampering? Is it no wonder we have kids roaming the streets at night for adventure. I would make them walk regardless of the weather. I and my twin brother had to walk 1.5 miles to the village school, every day. In 1964 we walked in the snow of the severe winter. But too much today the kids are wrapped in cotton wool. God help this nation if we had a major crisis. I think it is a great idea. I am a working mother who always rushes around to get my daughter to school in time in the morning, only to sit in traffic for half an hour. It would benefit so many people, including creating more ways for children to meet new friends from their school. I would certainly not be against paying a small fee to ensure that my child had a place on the bus with her friends. Yes, yes, yes! As someone who will have to do three different school drop offs each morning from next term (I live 2-3 miles between each school) I would love a school bus! I also agree about the amount of 4X4s and SUVs in the school run traffic - usually driven badly by a harassed parent on a mobile. I'm not sure that all these people who envisage traffic benefits will be quite so happy when they are stuck behind a fleet of yellow buses which stop every 100m to collect passengers, and which they cannot overtake when they're stopped. Far better to spend the money on safe, separated, cycle lanes. Leaving aside the obvious safety and environmental benefits for parents denied free travel for their children, even though they meet the distance criteria, it would surely be cheaper by school bus even if a reasonable charge were made to those who are able to pay. Add the productivity gains from saving half an hour at each end of the day not doing the school run and the economic and social cases are made. Get on with it government and local authorities. Why this obsession with "yellow" buses? In York and across North Yorkshire there are buses and coaches that do school runs - one school I worked at had eighteen buses daily dropping pupils off in the morning, and picking them up again in the afternoon. They could then go on and run other local services or charters during the day, evening and weekends. I can't see any advantage that the "yellow bus" scheme gives over this, but it would make it harder to use the buses for other services (equals wasted money, wasted resources) - who else would want to be seen on a school bus! As a primary school teacher, working in the UK until last September, I think that yellow buses are a fantastic idea. What a great way to cut down on the horrendous school-run traffic that everyone, teachers, parents and students alike, complains about. As someone who was denied free bus travel as a child for being one tenth of a mile too near to my school, I think the proposal that the yellow buses be free to the majority is well overdue. While I think the provision of such buses is a good idea, I'm a bit puzzled by the implication that for the scheme to work, we have to use the same kinds of buses as they do in the US, and painted the same colour! The picture at the top of the article brings home the point that the US buses are big, and not all that suitable for the narrow roads in many British villages. What's more, they're of a very old-fashioned design, which makes them unsuitable for anyone with mobility problems. I'm sure we can design something much better for our own circumstances, and perhaps even build it here. I lived in the States during many of my school years, and was baffled by the lack of school buses when I returned to the UK. Virtually all the kids went to school using these free buses, and as a result, there were few accidents. Other drivers treated school buses with respect and didn't try to pass them when they had stopped to pick up or drop off the children. Once back in the UK, my brother got off a normal bus used to transport school kids, and was knocked down by a car that had decided to pass it at speed. Luckily his injuries were not life-threatening. These buses are a fantastic idea, and should be rolled out throughout the country. Please can we not import the primitive, clunky, cramped, yellow, diesel buses the Americans use? I've no doubt this will be proposed as some sort of 'public-private partnership' cost-saving. It's bad for morale. We're our own country: we can do better. It's a good idea but its not a new idea. In 1981 to 1988 in Suffolk I used to get the school bus which served the outlying villages. The bus stop was 100 metres from my house. I don't think that is it important whether the bus is American or yellow the important thing is that it is free. What a wonderful idea. It would resolve safety issues of children walking fairly long distances to school, and reduce traffic congestion too. I worked as a taxi driver for a number of years, and noticed that in my area there were two rush hours each morning and afternoon... one for workers, and one for the school runs. I am sure that the cost would be less to the parents this way than it is running a car. I hope to see this come to fruition all over England. I grew up in rural Vermont, riding school buses for 12 years from the age of six. It's a necessary mode of travel, as the town was about 35 square miles and only a couple of students were able to walk to school, the bus was the only mode of transportation. The school owned and maintained its fleet of five buses. Virtually no parents drove their children to school, as the bus routes were comprehensive. When I came to the UK six years ago, I couldn't believe that so many parents congested the roads to drive their children to school. It's time to bring in the yellow school bus for all the right reasons! That sounds like a much more sensible idea than trying to tax everything under the sun so people can't afford to do anything! Better, cheaper public transport would do wonders for our roads and our environment. Safety for kids would be massively improved, I think most parents prefer to take their kids directly to school because they fear for their child's safety, whether it be from dangerous roads, or dangerous people. I think it's a fantastic idea - I can think of very few drawbacks to this plan and I'm quite happy for taxpayers' money to be spent on a scheme which in the end benefits the economy, society, children's education and the environment. Bring on the school buses, please! This is such a no-brainer - I'd pay extra on my car tax to cover the cost. Every school holiday, my 30 mile round trip to work and back is a third quicker and it is actually a pleasure. Bring on the school buses, please! Sounds like a good idea, but no doubt certain parents will still prefer to drive the child(ren) to school in their 4 x 4! I used to walk to the end of my road (20mins) every morning and if I missed the bus it would be a 3 mile walk to school. And no, I didn't suffer from obesity as a school child! This is the most sensible suggestion I have heard for a long time. At my daughter's school, people who live, even 10mins walk away regularly take their children to school by car and invariably park right outside the school gates causing numerous complaints/near misses and making it harder for children who do walk to cross the road safely. I live in an area that has a dedicated school bus to take the children from our village to the primary/junior school in the next village. The bus picks the children up near to their homes and delivers them home again but still some parents take children to school in the car. There is still congestion at the school with the cars coming and going. Why do they do it? Because it is easier to get up at 8.30am and drive to school for 9am than getting their children up and out of the house by 8.20 am to catch the bus. When I grew up in Cornwall in the 70s our village primary school was 3 miles away. I walked each way as my parents didn't have a car. How impressed was I when at aged 11 I was bussed free of charge to the nearest secondary school 11 miles away? What has happened to this free service? We have a social responsibility to ensure that our children have access to education free of charge and subsidised for those closer that cannot afford the paltry public transport available. Brilliant idea. I avoid "school run" times in Bristol as the streets around schools are often gridlocked and as a cyclist I value my lungs too much. This is the approach the government should be taking rather introducing punitive stealth taxes like road pricing. The yellow school buses are already in existence in many parts of Scotland. Would be a good idea to have them all across the UK. The yellow bus is a great idea; even though we live close enough for my son to ride a bicycle to school, many of his classmates' parents are afraid to let their children ride in because of the knot of traffic. The reduced congestion would mean that cyclists would be safer, and his friends' parents might allow them to risk mixing it with the traffic. It has to be a price worth paying. About time something is done! I always used by bike to get to school, but these days the roads are so busy it cannot be that safe for the kids? I am guilty of driving myself to work in the next town, when I could cycle most of the time. However I live by three schools and the roads around me are like race tracks in the mornings, so even I am not safe. When the school holidays are on, my 20 minutes journey becomes at most 10 minutes! Our children are getting ill, because they never walk anywhere and those that do have to breathe in all the fumes from their class mates parents cars! If the buses came, I would cycle to work knowing I was safer and the kids would be safer too. I rode on school buses in the US a few years ago - and they were very uncomfortable! Badly sprung, no seat belts, no cushioning on the seats, they were bone-shaking rattle-traps, which no sane adult would tolerate as transport. Mind you, the local bus service in Virginia wasn't much better! By all means, introduce the system to reduce traffic, paint school buses yellow if you must, but don't bother trying to import the originals - use modern buses, please! We did used to have a free bus to our local school, although we live slightly within 2 miles. But it got taken away, so instead we have a terrible congestion problem outside the tiny village school which has so far led to a number of vehicle collisions, and it's a matter of time before a child gets injured. The lane to the school was assessed as being safe for children to walk, although it has no pathway, is narrow with blind bends, and speeding drivers! I grew up in south-west Scotland and went to school every day for 6 years on a yellow bus. It was great, very rarely had problems and meant that we all got to school and back safely. The introduction of these buses everywhere would reduce the number of road users, encourage kids to socialise with others and allow parents to reduce their costs as well. Bring them back! An excellent idea - the counterpart of course being a permit scheme for the areas around schools to prevent selfish parents form circumventing it. About time! Next, ban parents from driving little Jonny (or Jess) to school to make everyone use the buses.. The idea of yellow school buses is an excellent idea, my husband has remarked on several occasions how the volume of traffic is a lot less during the school holidays and that it takes him less time to get to work. This idea would benefit all road users and most of all the environment. It would also cut down on the dangers actually at the school gates from parents dropping their children of by cars, it is absolute chaos each day. I think its an excellent idea. There are some benefits of such a scheme being introduced in the UK in reducing traffic but comparing the UK directly to the USA is not strictly feasible. In many parts of the States these Yellow Buses only make two trips a day; to school and from school. For the rest of the day you see the Bright Yellow Buses sitting dormant in Bus Depots, not particularly good economic sense. There could be more feasible schemes where local county councils use public buses commissioned for the 2 school runs but they then revert to public service through the day. Any scheme which helps to improve the environment and reduce the traffic congestion must be a good idea for all of society? Totally agree with this idea. I have 2 young children who at the age of 13 will be going to a middle school 5 miles away and will be faced by the prospect of how they will get to and from school. The idea that they would be picked up near our house and delivered to their school safely and returned, would do a lot to reassure myself as a parent. I live in a rural village with very poor public transport and strongly support the provision of free transport to school or college for all those in full time education aged 18 or under. This should be irrespective of means and be available to all including those in private as well as public education. The actual cost would be miniscule compared to the overall safety, environmental and educational benefits to society. Buses or no buses, I feel children should go to their local school, and not be sent to one many miles away purely because it has a better reputation. 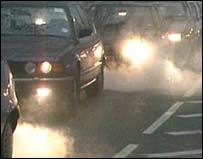 Apart from causing more pollution because of longer journeys, it merely widens the gap between good and bad schools. Great! Let's do it then! And sooner rather than later. I agree with replacing queues of cars with one bus, great for rural areas but will it be used by the inner cities "School Run Mum"? I believe that in line with the latest Government ideas on car taxation, parents who commute less that 1 mile, in an area with suitable public transport, or where this scheme has been adopted, should be taxed at a higher rate to try and drive down the amount of carbon dioxide produced right outside our school gates. My children walk to school and always have. If they could, they'd ride their bikes, but in my experience, most schools in the UK do not allow bikes on their grounds. Varying excuses have been given, ranging from "we don't have the space or security for bike racks" to "it would be too dangerous for the children." I think that some of the reason may be a reluctance to have to deal with any legal issues arising from thefts or accidents that may occur. We need to campaign for bicycle access and secure storage at schools - a Bicycle Proficiency Test. Most kids nowadays aren't properly taught the road rules when they are given a bike and allowed out on the public highway. Don't forget that these school buses would have to be highly maintained to get these safety benefits. It is illegal in America to overtake one whilst it is parked. Personally, I think it's a great idea and the less cars doing the school run the better. This model still works on the assumption that mum is at home to wait at bus stop with children until the bus arrives. In mine, and in thousands of families across the UK, we undertake "the school run" en route to work for which we have to use our cars - this scheme would not work for such families. I grew up in a Yorkshire village. 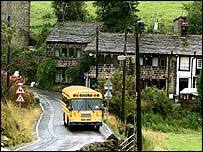 My school was about 4 or 5 file miles away on the bleak moors. We had to have coaches to take us to school - as did all the other outlying village children. There was no such thing as a school run! We need to do something; this situation is getting ridiculous. I now live in the suburbs and some of my neighbours take their children to the local school (less than a mile away) by car every morning - some of them don't even go on to work by car afterwards! Of course. Why has there never been such a system here before? Parents might welcome it the more too once rush hours miles get priced sky high. Even if they had to pay fares it would be cheaper. It's nothing new, during the late 70s and early 80s I used a designated school bus to travel to both my first and middle schools. Bringing back school buses for all would definitely reduce traffic if all children had access otherwise parents will still use the car to take the children to school and adding yellow buses would just create more chaos to the mix! I think it is a good idea in theory but should we really be following behind America in everything they do? Can't we come up with a new innovative scheme that England can put its name to. What a great idea! These types of buses would stand out from the current use of commercial buses and coaches, allowing drivers to take more care when approaching, as well as reducing the congestion from the dreaded school run. Sounds like a good idea. The roads in South London are much, much quieter during the school holidays - scientific proof that mums in their Land Rovers are solely responsible for the capital's traffic problems! Why the government haven't acted on this yet is beyond me. The advantages are numerous and the most noticeable effect would be the drop on traffic congestion. It sounds easier and cheaper than "big brother" satellite tracking in your car, doesn't involve infringements of civil liberties or the potential to waste huge amounts of money on unproven technologies. Surely a "no-brainer"! I think yellow school buses are an excellent idea. I live near two schools and the amount of traffic they generate in the mornings is ridiculous! If the kids got on a bus instead, pollution would be reduced and drivers in my area would be far less stressed. Even better, in the summer perhaps the kids should walk to school? Keep the kids healthy and tackle obesity at the same time. Anything which might help cut the growing plague of lumbering 4x4s on suburban roads at busy times would be worth a try. But I guess it's more likely to be most successful in rural areas. It's about time some sensible suggestions were made to ease congestion. School buses are an excellent idea, children will arrive at school on time and have an opportunity to socialise with school friends. I am 36, from the age of 9 I used to get a free bus from where I lived to travel the five miles into Bedford to go to school. We were picked up from sites near where we lived [I could walk to the pick up point in 2 minutes] and were dropped right in the school playground. It worked then, it would work now and also get the kids off their backsides and toughen them up for entering the real world when they leave school. While I agree with these yellow school buses, I think that rather importing them from America why can't a British company make them here and secure British jobs. The company could buy the planning and specifications from the American builders. Looks good. Let's do it! This is exactly the kind of issue that the government should be concerning itself with. Want less cars on the roads at peak times? Well, stop blathering on about fantastically expensive schemes based on not yet developed technology and focus on something that demonstrably works. Thank goodness! Someone with common sense at last. My normal run to work is approximately one hour - during term-time. When the schools are on holiday - driving at the allowable speed, stopping for traffic lights, road signals, etc - my journey takes me a maximum of 20 minutes. The school run just totally snarls up the road system wherever you live - and, as an aside, do parents in urban areas really need SUVs and MPVs when there is only one child in the car? This sounds like a really good idea. I fully support it, especially if it means getting the majority of the cars used for the school run off the roads in the mornings. This will be better for the environment and also will mean I get an easier run into work! At last. The Americans got one thing right! The school bus is an excellent idea. I'm sure it would help to tackle all of the above issues as well as bullying. I think it would be important that like in America it collects from streets/ houses as opposed to stops. I think that a large amount of bullying occurs at bus stops. What's that, a suggestion to provide an alternative means of transport instead of just charging more for what we already don't have? Ah, that'll be something that'll be ignored then. Shame. We live 400 metres from our primary school. A leisurely 5 minute walk even with 5 year olds. People around us still drive even on beautiful days. Much as I support this we are going to need some draconian measures to hit these people. Let's also ensure that the buses provided truly reflect the environmental needs - make them electric hybrids at the very least we also need to change the law, as in the US, to prevent other vehicles passing - in either direction - when a school bus is stopped. An excellent idea. Would be a big help for traffic congestion, the environment and society in general. We moved to Norwich just over a year ago and the local primary school which is a 5 minute walk away was full. So my 9 year old daughter had to go to the next village school which is over 2 miles away. She was given a school bus pass, but to get to the nearest bus stop she needs to walk just under a mile most of which is country lanes. So it's much easier to just drive her to school and back each day. If they had a bus that stopped nearer our house I would be more than willing to let her get a bus to school each day. I assume this will be run by private companies? And who produced the report? Anyone with vested interests?! I wonder how many cycle lanes £124 million could create. It should be law that where possible children should go to school on the bus. The city in England I am from has terrible traffic problems that just seem to vanish when there is a school holiday. Enforcing this kind of service will cut back on traffic and hopefully be better for the environment. If it takes a parent an extra 15 minutes driving to drop one child off at school and we multiply that by say, 1000 children in a school that's a lot of CO2 emissions saved. Its good to see some people actually trying to find a sensible solution to an ongoing problem! The school 'run' is actually a crawl, and I don't count sitting in traffic as quality time with children. Everyone will get more time and the government can invent some more jobs to help with the rising unemployment figures. Just pity the poor drivers! At least some people can see that the way to improve the traffic situation is not simply building more and more roads. This is a great idea. Amazing how long it takes before someone realizes an idea like this would be good. This just about sums up how slow government takes to introduce moves against unnecessary car usage, much like the trip to work these days!! I cannot think of a single down-side to this idea. I also cannot think why this hasn't been in place for 20 years or more! The immense easing of rush hour traffic during school holidays is easily clear for all to see. Congestion is a major issue - this a very easy and cost-effective answer. Get this done NOW! Free buses for all children not just those over two miles away would be a good idea. As some people will still take a car for just a two mile journey. Also bringing back free school meals (and Free milk) is the only way to make sure our children get at least one good meal a day. Yellow buses in the US are equipped with special lights to indicate when children are embarking and disembarking. When they stop and turn the lights on, all traffic on the road (travelling in both directions) must stop completely. Driving past a stopped school bus is one of the most serious traffic offences, often resulting in loss of licence. As well as directly making children safer when crossing roads, this discourages unnecessary journeys around schools during arrival/departure times. Is the proposal to introduce this in the UK as well? I don't understand the phenomenon of the school run at all. I walked to school and find it bizarre that parents consider it necessary to drive their children two miles - a perfectly reasonable and healthy distance to walk. If nearby schools aren't good enough they should be improved not avoided by local residents. At last! These buses are a great idea, it will take the parents in their gas guzzling SUV's off the road and will be one step further toward removing unnecessary traffic from the roads. One bus alone will remove about 20-30 cars from the rush hour traffic. A very good idea, my children would love the chance to go on a bus to school. But why do they have to be US-style yellow school buses? What's wrong with good old fashioned UK-style red buses?